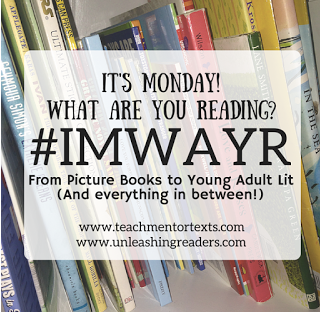 Every Monday, Jen Vincent at Teach Mentor Texts and Kellee Moye and Ricki Ginsburg at Unleashing Readers cohost It's Monday! What are You Reading? I've not been as good about sharing and linking up to other people's recommendations as I should be--it's a wonderful place to find great books to read and recommend both personally and professionally. If you're not familiar with this community, check it out. 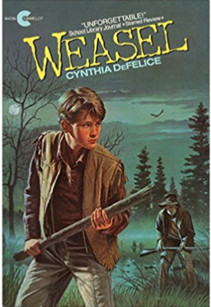 I read Weasel by Cynthia DeFelice years ago, and I remember how compelling it was. I remembered it as a good recommendation for boys who had trouble finding an engaging book. I'm tutoring a sixth grade boy who is a fluent but resistant reader, so I read it again and gave it to him. Set in Ohio during the mid 1800's, the main character, Nathan's father is missing. A stranger knocks on their door and leads Nathan and his sister to their injured father. The antagonist in the story is an Indian hunter called Weasel, and he is a frightening villain and depiction of how Shawnee Native Americans were treated during the time of Westward Expansion. While there are important messages of courage, honor, and ethical behavior, the story also sparks important questions about history in terms of the stories we tell, the truths we think we know, and the ones that are perhaps less widely shared but just as (or more) important. This would be a great book club book, as well as an important read-aloud paralleling a social studies unit on westward expansion or even on social justice and ethical behavior. It's short, it's compelling, and it's really, really important. Happy reading, happy slicing, happy Monday! Melanie, This is an oldie but goodie. I used to read this book aloud to my fourth graders when we studied Ohio history. The boys especially loved it. I hope this book will be just what the sixth grader needs. Thanks for the recommendation Melanie. I'm holding it for a rainy day with a boy who will appreciate it. Thanks for the recommendation, Melanie. Rereading well loved books is a special treat. 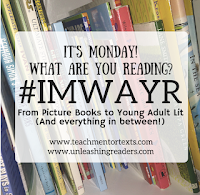 I've been to the IMWAYR site, but not consistently. Perhaps it's time. I haven't heard of this, Melanie. We have a few of those resistant readers, and this sounds like a perfect choice for them. Thanks for sharing!